I love to work with people on improving their fitness skills, become stronger, lose weight, tone their body, and helping them with their eating habits. I love being a personal trainer because not only does it not feel like a job to me, but I love the outcome of what others feel and say about my workouts. 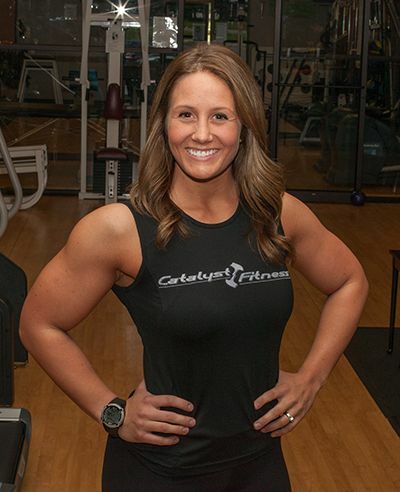 I have been into fitness since high school, so being a personal trainer has always been a dream of mine I am very thankful I am able to fulfill it at Catalyst Fitness. Working out and doing bodybuilding competitions! After playing volleyball in college, I used to be a club and high school volleyball coach, but now I just give private lessons. I love to come up with new recipes to cook, being with my husband/family/friends, water sports, shooting guns/hunting, and doing anything outdoors.